For a long time now, the GP Alkaline A76 (LR44) Button Cell Batteries (also known as LR44, V13GA and PX76A) has been one of our best selling GP Batteries products and it’s not really hard to see why given the diversity of this battery. You will probably be thinking an A76? What on earth is an A76? For some people this is the case, having only ever heard of AA and AAA batteries. At the same time however the possibility that at least a couple of electrical items in your household use this cell are incredibly high, despite you knowing it. A lot of people I know actually throw away small DVD remotes they have had thinking they are broke, when a cheaper alternative to a replacement would be that by unscrewing the back of the remote one or two of these or perhaps another button cell are nestled inside. Previously, I said that this cell was diverse and this is very true. 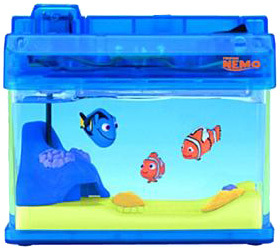 These cells are known to be used in a wide range of watches, calculators, small remote controls and even small toys such as the Microaqua Aquarium (pictured above). So with this new found knowledge about batteries you never even knew existed, go and dig up that old remote which hasn’t worked in ages and just double check to see that this isn’t what is inside it. I guarantee at least a couple of items in your household will use this battery! We currently only sell this battery in a neat little blister of ten, but when you understand that for the low price, usually items use a couple or more of these cells at the same time, compared to the cost of AA or AAA batteries that you may be familiar with, they are incredibly cheap, so why not grab a bargain now by buying some of these very useful GP Alkaline A76 (LR44) Button Cell Batteries.